3, Switch view from MediaInfo menu, select 'View' then from the drop down list select 'Text'. This will provide a simple but detailed list view as per this screenshot. 6, You can select the text in MediaInfo and then copy and paste then your posting. Remember to use the 'Code' option and paste the text into the code box on your posting so that it's more readable. 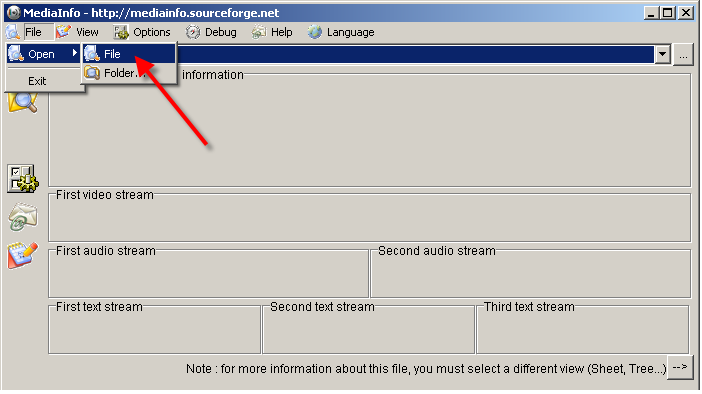 Media Info Lite can also be downloaded from http://codecguide.com/download_other.htm. Its for Windows users. Once installed allows you right-click on a media file from Windows Explorer and get MediaInfo information from the context menu. Please do not PM me for support as any solution cannot be shared with others. you can use https://mediaarea.net/MediaInfoOnline to read media info. No media is transmitted over the internet. It uses a compiled library for WASM.